Description: This grassy prairie is where the first battle of the US-Mexican War was fought in May of 1846. Today you can walk along interpretive trails and view the location of various parts of the battle. Location: Brownsville, Texas at the northeast corner of the intersection of FM 1847 (Paredes Line Rd) and FM 511/FM 550. Operating Seasons and Hours: Park Gates are open from 8:00 am to 5:00 pm every day. Date of Visit: Sunday, November 2, 2014. This was the third stop of the second day of the Texas Coastline Roadtrip that my husband and I took our kids on in November of 2014. We left South Padre Island and traveled about 30 minutes into Brownsville. Let's start this out by saying that there are very few circumstances when you should actually leave South Padre Island to go visit the Palo Alto Battlefield. This National Historic Park is really nothing more than a glorified walk through a field. Compared to all the fun and exciting things to do on South Padre Island, this place is pretty boring. The reason my family left the island was because our kids had all had major meltdowns at the end of our time on the beach. They were ready for naps, and the best way for them to take naps while on vacation was while riding in the car. At first we drove up and down South Padre Island to see if there was anything else that looked interesting. There wasn't anything that looked like the kids would enjoy it, so we decided to drive off the island. Our plan was to try to find a beach I'd read about that is even farther south than South Padre Island. I'd read about Baca Chica Beach on About.com. They said that it was supposed to be an undeveloped beach with all the beauty of South Padre Island without all the tourists. I wanted to check it out. So my husband and I decided to drive west from South Padre Island into Brownsville and then turn east again and go to Baca Chica Beach. But that didn't happen. We took a wrong turn through a construction detour and we were deep in Brownsville before I realized we weren't heading to the beach. By this point our kids were awake and full of energy again. We found somewhere to pull over so my husband could take a little nap while our kids played around and ate Halloween Candy. After that little break we looked at our map and saw that we weren't too far away from the Palo Alto Battlefield. This place had been on my "Maybe List" of places to visit so we decided to go take a look. First stop was the Visitor Center so I could use the bathroom. 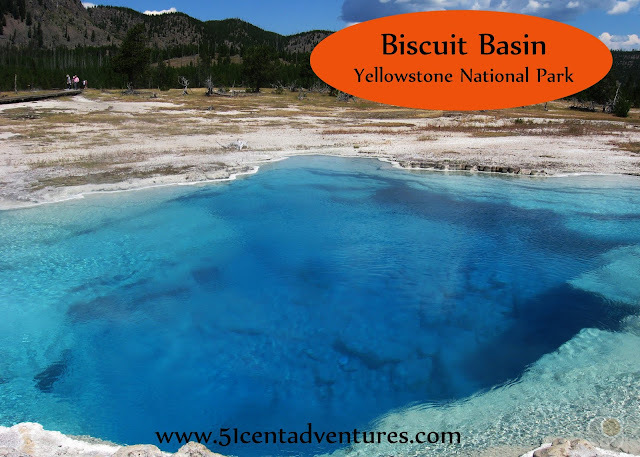 This building was like many other National Park Visitor Centers. The bathrooms were located outside the main part of the building. This helps cut down on crowds inside the Visitor Center. It's also convenient when the rest of the building is closed. The building was open so I took a quick look around. There were some displays that talked about the history of the US-Mexican War. I didn't see anything that would hold my kids' attention so I decided not to bring them inside. 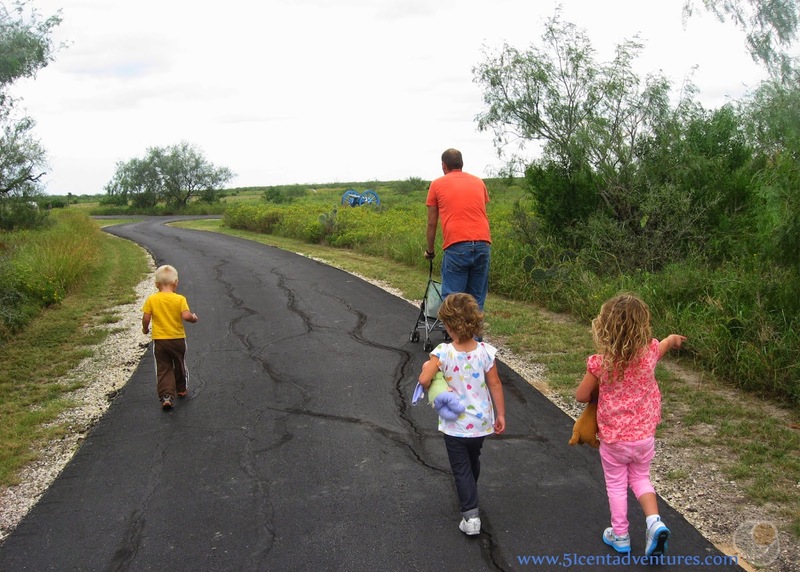 Instead we drove to a nearby parking lot and started walking on the series of paved trails that wind through the battle site. Most of the battlefield is just a field full of plants. There are some interpretive signs and some canons along the side of the trails. There are also flags and smaller trails that show where the battle lines between the US and Mexican troops were. Even though I've taken many history classes, I only had the vaguest idea of the history of the US-Mexican War. In fact, I kept getting it confused with the Spanish-American War that was fought almost 50 years later. I also kept muddling up events from the US-Mexican War with events from the Texas Revolution that happened 10 years before this war. Visiting this site, and reading the information plaques that were set up helped me kind of get a sense for what that war was about. I also did a little bit of research after our trip to help me get the history straight. This was the war over the annexation of Texas into the United States. Mexico did not recognize the annexation and wanted to keep her territory. There were also disputes over whether or not the Rio Grande River was the boarder between Texas and Mexico. The war started in April of 1846 when Mexican Troops crossed the Rio Grande and entered US territory in Texas. The battle fought at Palo Alto on May 8, 1846 was the first battle of that war. Artillery played a key role in this battle. Even though there were more troops in the Mexican Army their cannons were not as maneuverable as the US Army's cannons. That resulted in a victory for the United States. Over the next two years there would be many more battles in places such as Los Angeles, Buena Vista, and even Mexico City. A treaty was finally signed on February 2, 1848. The US-Mexican War would end up reshaping the political map of North America. When Mexico lost the war it would give up territory that covered what is now the Southwestern United States. States that were founded in that area include all or part of, Oklahoma, New Mexico, Colorado, Wyoming, Arizona, Utah, Nevada, California, and of course Texas. Recommendation: If you've run out of things to do in the area then the Palo Alto Battlefield is a good place to go for a relaxing stroll. However, unless you are a huge battle history buff, then I don't recommend this as a must-see destination. Directions: There are signs thoughout the Brownsville area that will direct you to the battlefield. 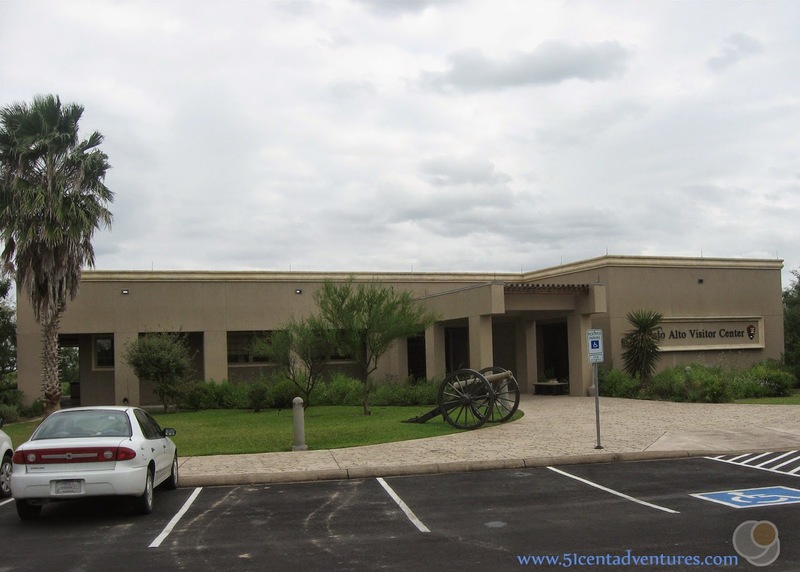 It is located only a few yards north of from FM 511/550 which is a major road into Brownsville. Additional Information: Brownsville is also the location of the Resaca de la Palma Battleground. That battle was fought on May 9, 1846 which was the day after the battle of Palo Alto. It is located six miles to the south of the Palo Alto Battlefield. The city has been built over much of this battlefield, but 34 acres of undeveloped field still remain. 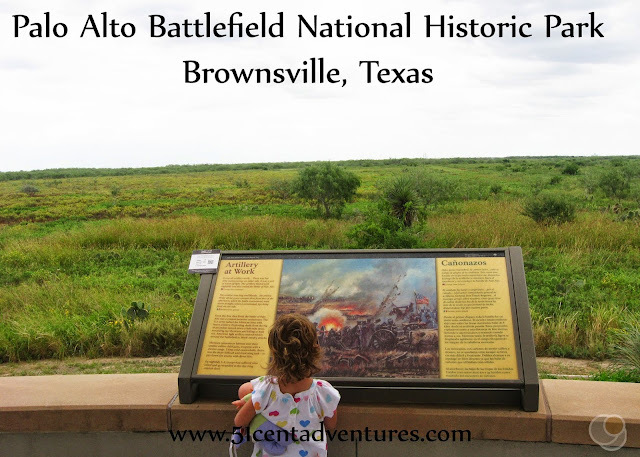 This battlefield is a second unit of the Palo Alto Battlefield National Historic Park. There are plans to add features to this section of the park as well. There is an annual Memorial Illumination held at this battlefield. Over 8,000 candles are lit in remembrance of the soldiers who died on both sides of the conflict during the two days of battle. 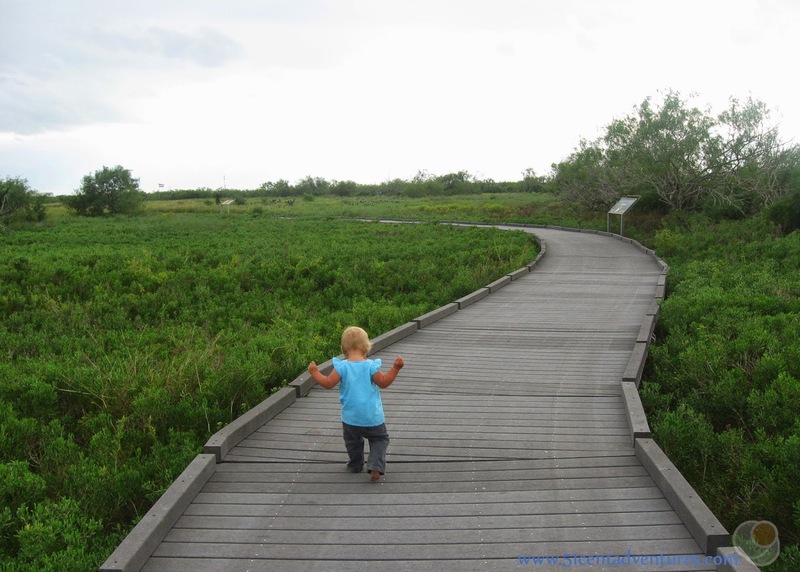 Places Nearby: If you are interested in birds more than battlefields you can visit the Resaca de la Palma State Park. (Not to be confused with the battleground with the same name.) This is part of the World Birding Center and preserves the 1200 acres of land around the Rio Grande River. I don't know why I didn't put this on my list of things to see in Brownsville. I'm a very novice birder so this would have been an interesting place for me. I guess I thought that it would be too boring for the kids. What I didn't know was that the park has a tram that you can ride on for almost three miles. We definitely would have stopped here if I'd known about the tram. Next Stop: Port Isabel Park Center RV Park and Campground.